When you’re working with a strong back light in any space, the first rule is to really amp up the colors and patterns. As soon as the items are put in front of the window, they will become silhouettes and sculptures, so you just need to get that working for you and not against you. Here’s a picture of the completed table at the same angle people would be coming to view it, before the centerpiece up-light was turned on. Notice how dark everything looks. Of course, at night, with all the artificial light, this would have looked completely different. I probably would have muted the colors of the fabrics and flowers. I knew that glass would have great reflective qualities against the flat brown rocks outside and that I could use that flood of natural light to my advantage, so I developed a concept of using a collage of different sizes and shapes of clear vessels and vases. We bought way more than needed from Z Gallerie, Michael’s, Hobby Lobby and Crate and Barrel, which I think is great strategy as it is always better to edit than be missing something key. And by mixing in less expensive pieces with the more pricey ones, it was friendlier on the wallet. 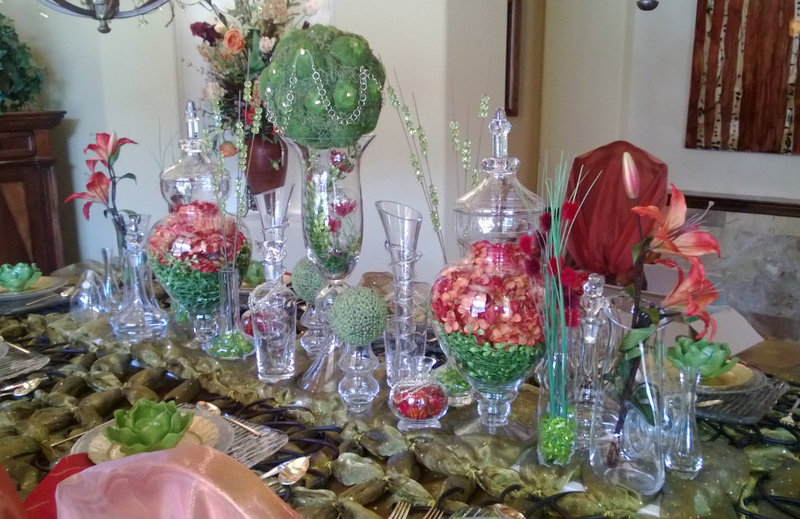 The clear glass was also an attempt for me to pretend that you could see other guests at the table without dipping and dodging… that was lost once I put pretties inside. Had this been an actual luncheon with food and guests, we would have grouped the larger items on a nearby buffet area. 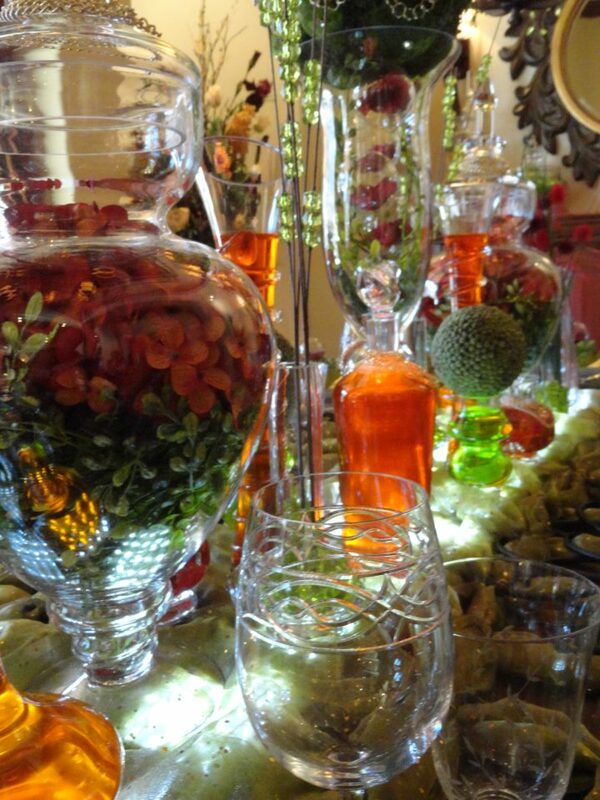 To bring our garden them into play, we added greenery and deep orange flowers to the larger containers and the centerpiece was filled with the same flower stuffed glass ornaments as were on the place setting and one of my favorite elements on top- a jeweled giant moss topiary ball. It was pretty by itself, but need some bling, so we inserted 50 cents worth of gold thumb tacks and some gold chains we got from the DIY jewelry isle at Michael’s. We also added chain to the larger vessel’s lids and some of the other smaller pieces in the arrangement. DESIGN TIP: If you notice, other than the center vase, there are exactly two of each container that are placed in a mirror image along the center so that the left side faces one side of the table and the right side faces the other. 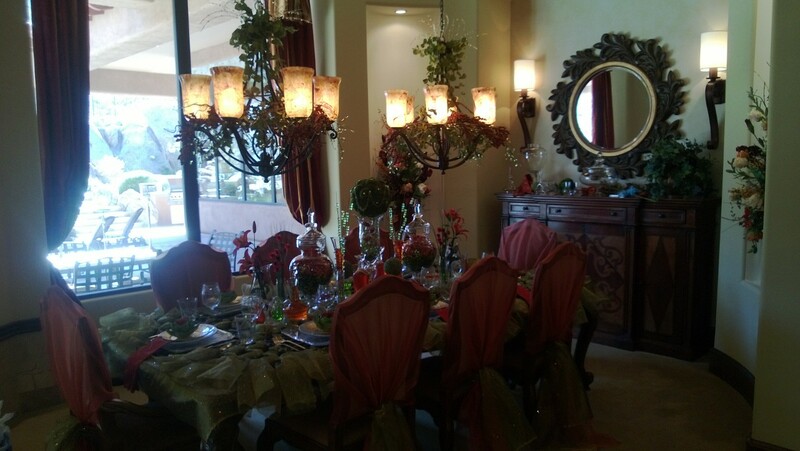 This gave the centerpiece a formal balance using symmetry that elevates the “garden” status of the décor. An easy trick of the trade you can do with anything: symmetrical = formal, asymmetrical = casual. The two final steps in making this table sing were flat square LED boxes that added a smidge of height and some food coloring from my pantry. 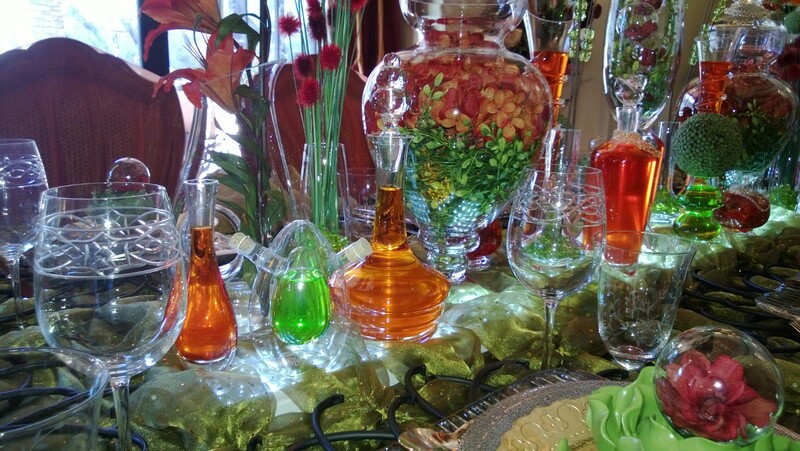 By far, the biggest bang for the buck on the whole table was food coloring in water. That really put our window to work and then when we turned the LED vase lights on underneath them, the centerpiece was simply luminous. This is a WOW-factor that has limitless applications! Stay tuned for chairs and chandeliers!